Donald Trump's staggeringly dishonest Twitter rant about cancelling his trip to London triggered a gleeful display of quintessentially British piss-taking on Twitter via the #ICancelledMyTripToLondon hashtag. Trump lied that he was cancelling his trip to London because Barack Obama and the Democrats supposedly did a deal to move the US Embassy to a new location, but the plan to move out and sell off the old embassy was actually drawn up in 2008 by the Republican George W. Bush administration. Everyone could see that Dotard had just made up a ridiculous lie to cover for the fact that he's afraid of facing the large public protests the British people would undoubtedly put on against his near constant stream of bigoted rhetoric. Here are a few of the more amusing examples. #ICancelledMyTripToLondon because my advisers - great advisers, the best - sang me that London's burning, and they're fetching the engines, and there's fire fire. Probably because of their terror problem. UNSAFE. #ICancelledMyTripToLondon when I realised there was a 1 in 12 million chance of bumping in to Boris Johnson. #ICancelledMyTripToLondon because it turns out there is a London in Ohio, much closer, smart! #ICancelledMyTripToLondon because Piccadilly Circus doesn't even have clowns. FAKE NEWS! What could be more British than ribbing someone after they've huffed off in a strop? 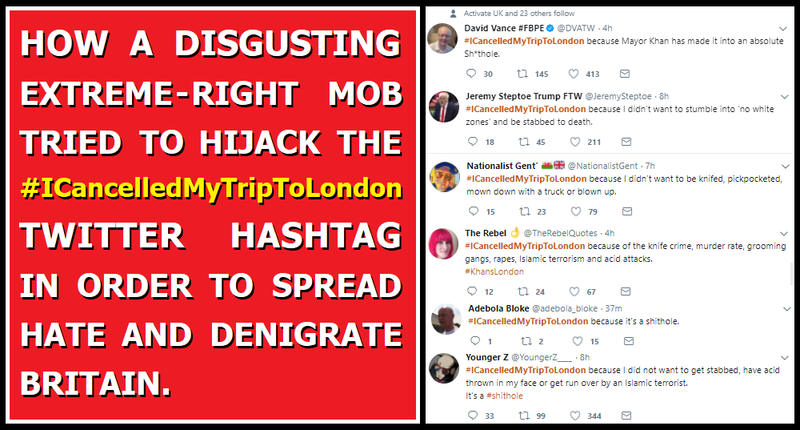 Well there are many on the British extreme-right who clearly feel a much stronger affinity for Donald Trump than they do for their own nation, because they were so upset at people taking the piss out of their beloved right-wing idol that they set about trying to hijack the #ICancelledMyTripToLondon hashtag to humourlessly denigrate Britain, and especially London. #ICancelledMyTripToLondon because I did not want to get stabbed, have acid thrown in my face or get run over by an Islamic terrorist. #ICancelledMyTripToLondon due to rampant knife crime, acid attacks, terrorist attacks, drive-by moped robbery & no-go zones. #ICancelledMyTripToLondon because I didn’t want to stumble into ‘no white zones’ and be stabbed to death. #ICancelledMyTripToLondon because Mayor Khan has made it into an absolute Sh*thole. #ICancelledMyTripToLondon because it's a shithole. #ICancelledMyTripToLondon because I didn’t want to be knifed, pickpocketed, mown down with a truck or blown up. #ICancelledMyTripToLondon because it's turned into a third world shithole. #ICancelledMyTripToLondon because I don't much fancy getting stabbed, beaten or anything else horrendous by feral, lawless lunatics. #ICancelledMyTripToLondon Because it's not even a British city anymore & my birthplace is now a crime ridden shithole.. 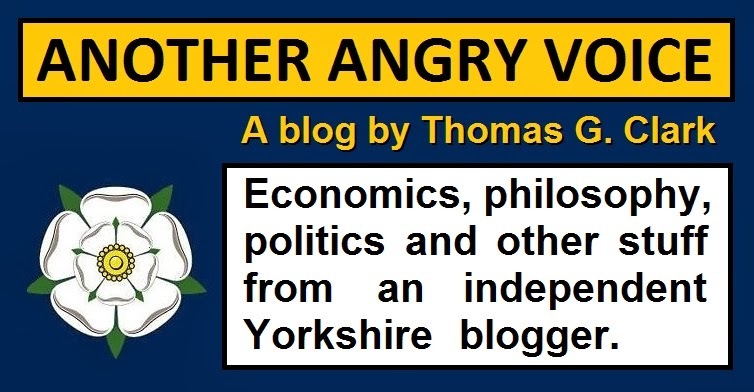 It's absolutely remarkable how much hatred and denigration is being aimed at Britain and it's capital city by this extreme-right rabble. It's even more remarkable that this odious hate mob have the absolute cheek to pose as pro-British patriots, and even use British and English flags in their Twitter handles and biographies. It's beyond obvious that this disgusting mob hate their own country with a passion, because not only do they openly and shamelessly denigrate Britain, they've also attempted to hijack a quintessentially British display of ribbing with their displays of hateful and pathetically humourless extreme-right ranting.